To attract new referrals, generate a referral link. You can place the link on your personal website, in a blog, insert it in your forum signature, or advertise it in any other way. 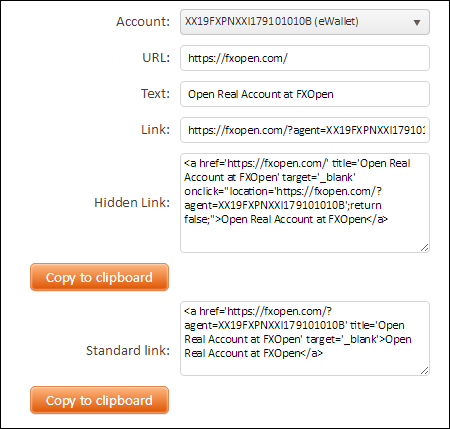 Click Partnership → Text links in My FXOpen. URL: Enter the URL address of the page to which your referral link will lead. Text: Enter the text of your referral link. Link: URL address of your agent link. Hidden Link: Use a hidden link if you do not want users to know where your referral link leads. Standard Link: The URL of the page is displayed when the user point to the link.